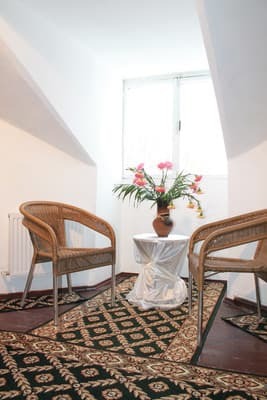 Kharkov art-hotel "Calypso" is located on the upper and attic floors of a historic building of the late XIX - an old mansion with a weather vane on the dome and a beautiful facade. 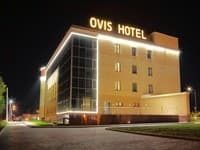 It offers free Wi-Fi, a 24-hour reception and brightly decorated themed rooms of author's design, as well as a mini-gallery of works of classical and modern art, a souvenir shop. The metro station "Zakhisnikiv Ukrainy" and the metro station "Sportivnaya" are just 800 meters from the art hotel. The rooms are individually decorated in loft style using bright colors and tones, recreating the atmosphere of art and the historically formed atmosphere of artistic brotherhood, and the windows offer a beautiful view of the historic center of the city. 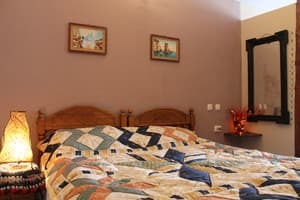 The rooms have a sofa, a TV, air conditioning, a private bathroom, and 7 of the 8 rooms at the Art Hotel also have a separate bedroom and a fully equipped kitchen. Room "Cabin-company" is located directly in the preserved historic dome of the building with a weather vane! 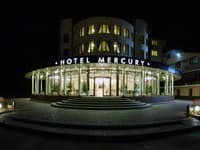 Within a 10-minute walk from the art hotel there are many restaurants, shopping and business centers, institutions, supermarkets, banks, pharmacies and a large Konnyy market with its own suburban bus station. 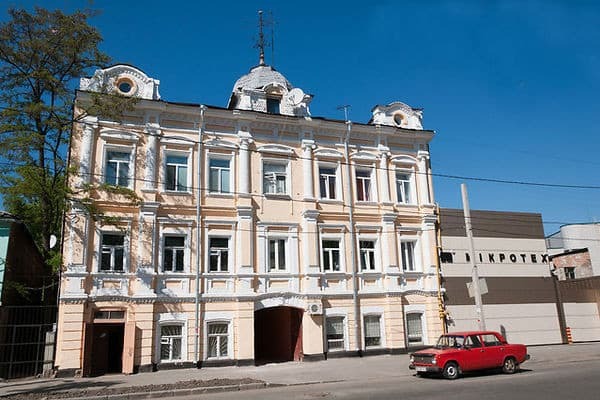 The Art Hotel Calypso is 800 meters from the Metalist Stadium, 2 km from Pokrovskiy Cathedral and 4 km from Freedom Square. The staff at the Art Hotel will be happy to help guests book tickets for local attractions and events. In the immediate vicinity of the hotel is free parking. We speak Russian, Ukrainian, English and Chinese. Our art hotel "Calypso" was created for true connoisseurs of historical antiquity and artistic creativity! 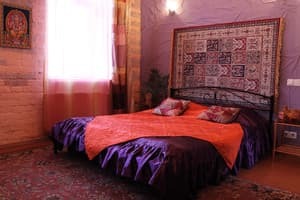 Description of the room: The number is made in the author's design, the decoration of which are photo collages on the walls of the room and bathroom from the selected illustrations of magazines of the era of the USSR and the CMEA countries, warm wood ceiling. The bathroom is equipped with a shower cabin, toilet and washbasin, lined with bright tiles in contrast combinations. Colors: light olive, coffee with milk. 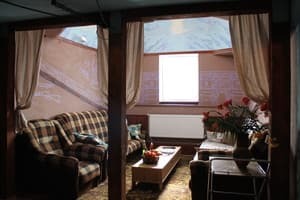 The room is comfortable, cozy and allows you to plunge into the atmosphere, returning to the old, good past of Soviet times. The room has a comfortable double sofa bed. 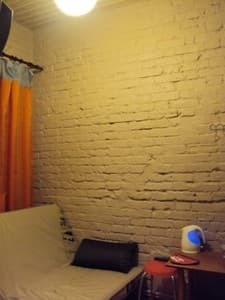 Area of ​​the room is 8 sq.m. Description of the room: The room is located on the attic floor. From its large window there is a beautiful view of the historical buildings and small mansions of the old center of Kharkov. The room is equipped with a kitchen equipped with microwave, electric stove, refrigerator, kettle, sink, kitchen furniture, crockery, cutlery, dishcloths, tablecloths. The decoration of the room is a vintage antique table in the dining area, a large photo collage with roses, a graphic applique with romantic and naive plots of postcards and illustrations on the wall, aged parquet on the floor, carpets and rugs with a classic pattern, forged beds, vintage silk and taffy exquisite lampshade lampshades and a table lamp, a lot of white satin draperies, a warm wood ceiling. The bathroom is equipped with a shower cabin, toilet and washbasin, faced with vintage Spanish tiles, boldly combined in its plot. The room is comfortable and cozy, high ceilings repeating the gable roof. Room size is 32 sq.m. Description of the room: The room is located on the attic floor. From its large window there is a beautiful view of the historical buildings and small mansions of the center of Kharkov. The decoration of the room is a rarity antique cupboard, carved oak beds, an old mirror of Venetian work in a carved frame, wallpaper with a fireplace, graphic compositions on the walls with the statement of Indian leaders in the dining area and in the bathroom, a comfortable folding double sofa. The room is equipped with fully equipped kitchen. The room is comfortable and cozy, high ceilings repeating the gable roof. Description of the room: The room is designed in a designer style with satin cream-white ceilings, wallpaper with a classic baroque design, as well as in the room oil painting and a large reproduction of Van Gogh in the dining area with a picture of a street cafe in Montmartre in Paris, a bed with an open baldochin and comfortable velor classic double sofa bed. The color scale is light and light and at the same time it is alive, contrasting. The motives of the Parisian style a la Amelie are used, which have a rest and fun. A view from the windows to the streets of old Kharkov and the roof of the houses. Room is equipped with fully equipped kitchen. 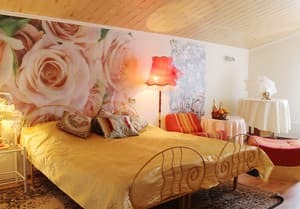 Area of ​​the room is 38 sq.m. Description of the room: Room India is a spacious multi-functional room with a total area of ​​42sq.m. The room is equipped with a kitchen. The decoration of the room is a tall satin ceiling of the color of a tea rose, intricate wallpaper with an oriental pattern, curtains on the windows and cushions of hand sewn, made in the technique of the stove. In the dining area is a large antique round wooden table. A view from the windows to the streets of old Kharkov and the roof of the houses. Description of the room: This is a 2-room suite. A suite under the dome, located in the attic. As the process of hitting the attic is carried out using a steep wooden staircase with chiseled balusters of handrails, as well as the fact that in the space of the galley (kitchen) there was a window-porthole. From the windows you will see a beautiful view of the historical buildings and small mansions of the old center of Kharkov, and the windows in the dome part allow you to admire the sky, the sun, breaking through its colored stained glass windows. The room area is 51sq.m. The decoration of the room is a huge painted dome, graphically portrayed galleys, frigates, peepalies, a ship's cannon and carved panels, sketched from the original, referring to the times of filibusters. Stained glass windows in the dome part, the masts of a naked rafter system with a "canvas" and "fishing" net, a warm bedroom ceiling lined with natural wood. 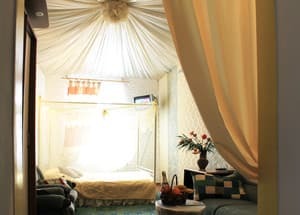 The room is comfortable and cozy, very interesting with a game of heights - from a high dome in the living room to a small height of the bedroom. Не понравилось ничего. Стены обшарпаны, мебель в безобразном состоянии. Деньги за 1 ночь мы заплатили, а не поселились. Противно. Жил в одноместном в принципе для того чтобы переночевать по критерию цена/качество не найти. Душ, туалет, холодильник всё есть. Тепло. Ключи дают на руки можно свободно выходить заходить в любое время. Находится в центре города добраться до метро дело 10 минут на выбор 3 станции метро. От автовокзала можно пешком дойти до отеля. Плохо ловит Wi-Fi но обещали это исправить установив еще один роутер на нижнем этаже. Тяжело найти отель даже если искать через гугл мапс. Не работал телевизор, и не хватает микроволновки в номере. Для своей ценовой категории - все отлично. Я брал одноместный номер. В принципе получил то, что ожидал. Удобно для местных мужчин, чтобы снять мадам и провести время, но не с приличной девушкой. Внешний фасад дома - "0"; для служебной командировки - "0", "ретро - совок" во всем, от входа до сервиса, отсутствует печать - документы не оформишь, не оформленный персонал, горячая вода есть - и нет. Шум с улицы, даже при закрытиых окнах. Это не отель, а апортаменты. Еле нашел. С улицы нет вывесок. Въезд со двора. Подыматься по пожарной лестнице. Сервиса нет никакого. Пром зона. За эти деньги дорого как для такого "ночлега". Душевно! Очень мило, приятные люди, уезжать не хотелось. Все супер! Так держать!!! Крутая лестница, очень осторожно если с детьми, особенно зимой! Прекрасно отдохнули. WiFi скоростной, свободный, детям было, чем заняться. Чайник, фен, холодильник-все работает. Чисто, аккуратно. Ничего, кроме цены и того что здоровы остались. грязь, шумоизоляция, аварийное состояние дома в котором находится гостиница. The rooms can provide one extra bed. The cost of additional. places - 50 UAH. Near the hotel there are cafes and restaurants. Metro stations "Pl. (Alekseyevskaya line) and Sportivnaya (Kholodnogorsk-plant line), trams No. 2, 5, 6, 8, 27, by fixed-route taxis - No. 11, 211, 234, 242, 249, 251, 292 , 231.